Despite the title of this blog, the term metaheuristic is not really well defined. Tabu search may be viewed as a "meta-heuristic" superimposed on another heuristic. The approach undertakes to transcend local optimality by a strategy of forbidding (or, more broadly, penalizing) certain moves. In the AI field, a heuristic is a specific method that help solving a problem (from the greek for to find), but how must we understand the meta word ? Well, in greek, it means "after", "beyond" (like in metaphysic) or "about" (like in metadata). Reading Glover, metaheuristics seems to be heuristics beyond heuristics, which seems to be a good old definition, but what is the definition nowadays ? The litterature is really prolific on this subject, and the definitions are numerous. the last one that use the term only for evolutionnary algorithms when they are hybridicized with local searches (methods that are called memetic algorithms in the other points of vue). The last one is quite minor in the generalistic litterature, it can mainly be found in the field of evolutionnary computation, separate out the two other tendencies is more difficult. aiming to tackle a large scale of "hard" problems. As it is pointed out by the last reference, a large majority of metaheuristics (well, not to say all) use at least one stochastic (probabilistic) process and does not use more information than the solution and the associated value(s) of the objective function. Talking about combining heuristics seems to be appropriate for Ant Colony Optimization, that specifically needs one (following Dorigo's point of vue), it can be less obvious for Evolutionnary Algorithms. One can consider that mutation, or even the method's strategy itself, is a heuristic, but isn't it too generalistic to be called a heuristic ? 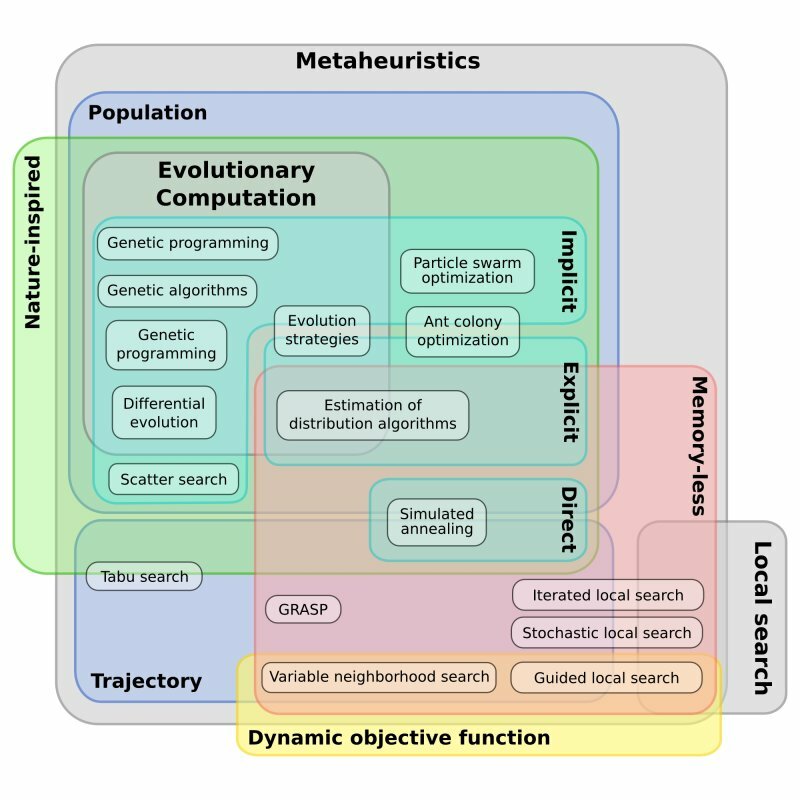 Metaheuristics are algorithms designed to tackle "hard" optimization problems, with the help of iterative stochastic processes. These methods are manipulating direct samples of the objective function, and can be applied to several problems without major changes in their design.